By Gordon Frickers 45 x 53 cms (18″ x 21″), oils, available, ex studio, ex frame. Try our free fun XE Currency Converter to discover the price in your currency. 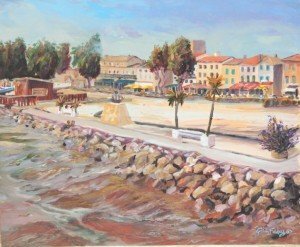 Pauillac, this landscape was painted plien aire as a broad canvas, on location over quiet 2 days, the open space and yachts ashore hint of the delights during the high season . 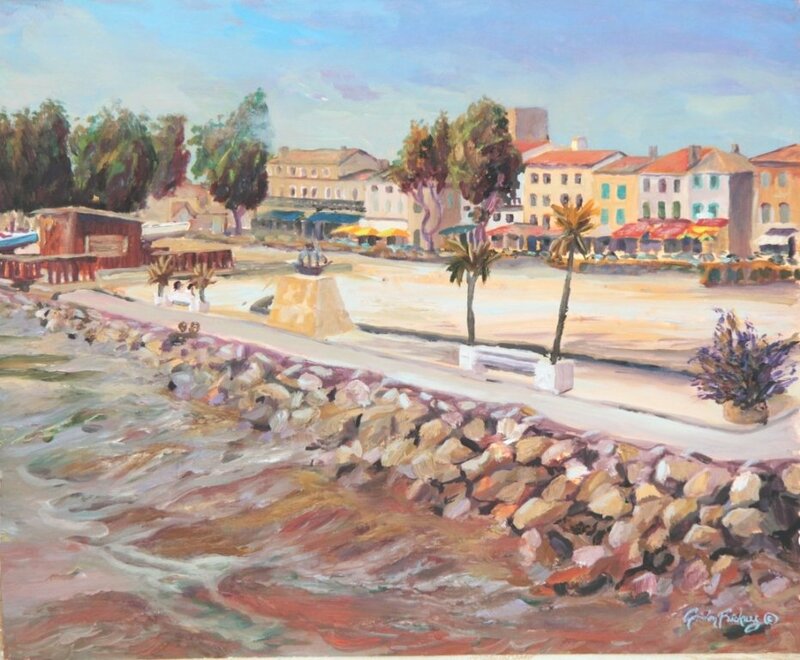 This painting Pauillac from Club Nautique & marina captures something of the quintessential nature of the long sandy, salt sea boulevard. Pauillac, Pauillac those who love fine wines will know this name on many distinguished labels. La ville de Pauillac in the Medoc, formally a busy port for South America and the first port in France to have a air post from Paris, each long Bordeaux summer basks on the banks of tidal river the Gironde. The old town is a gem missed by many tourists. The distinctive long boulevard fronting the Gironde offers a good choice of restaurants, many with a nautical ambiance. There is also a curious museum of automated animals. The tourist information office is way above average, easily accessible, offering free wine tastings and some times evening entertainment on the banks of the Gironde. Sited against the banks off the tidal and fast flowing Gironde Pauillac accommodation is usually easy to find and the municipal camp site is romantically placed. Pauillac offers many surprises including a varied history, example, at one time Pauillac was the port of departure for French ships bound for South America. Step into the side streets and discover the older Pauillac. Pauillac is a pleasant well situated base for exploring the Medoc.